PERSONAL BRANDING!! It’s now mid-year! Time to take your goals to the next level to achieve you year end goals. What is your personal brand? Don’t miss this opportunity to enhance your personal brand! Driven by the conviction that professional presence is the key to success and that it can be learned, Toussaint focuses her business on helping clients enhance and radiate their best image. The result – financial and personal success. 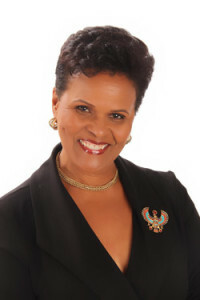 Toussaint is a sought-after speaker for events sponsored by companies, business groups, chambers and churches on professional image, personal branding and career transition strategies. She provides individual consulting on professional appearance, comportment and communication. In addition, she coaches professionals on interview preparation, networking skills, professional attire for media appearances and presentations, resulting in a successful brand image for clients. As a professor at Palm Beach State College, she works with students to build critical human and customer relations skills in preparation for successful careers. Toussaint has over 20 years of experience as a human resources executive and senior client relationship leader with AT&T, Philips Electronics North America, Mercer Human Resource Consulting and Kaplan Higher Education with extensive experience leading and developing high-performing teams. She is member of HR Palm Beach County and the Chamber of Commerce of the Palm Beaches. Author of The Audacious Woman: Blaze Your Own Path to Prosperity (Brand Audacity) (Volume 1) Paperback – by Pamela Y Toussaint MBA (Author), Tamara Y Toussaint JD (Contributor) now available on Amazon.com. THERE IS NO CHARGE TO ATTEND THIS EVENT HOWEVER RSVP’s ARE MANDATORY! COMPLIMENTARY COCKTAILS AND APPETIZERS.